OK, I know I said that I had a couple of tops to show you but I made a dress and it pushed its way to the front of the blogging queue! 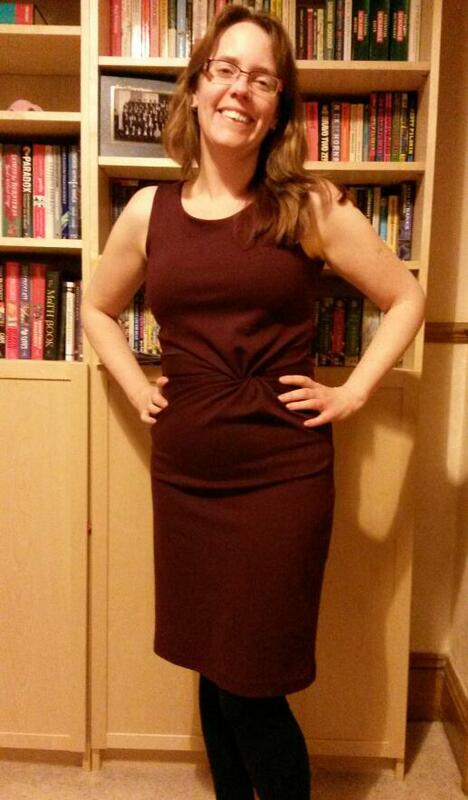 Here is my “In a twist dress” by So Sew Easy. I used the fabric that I bought at the Spoolette meet up at Dewsbury. It’s quite a thick jersey fabric (I’m sure it’s got a proper name like ponte but I’m not 100% certain as it didn’t have a label!) This is my second attempt at sewing a garment in a knit fabric. The first one (here) was fun to sew (not to cut out) but it’s all pulled out of shape now – not enough to stop me wearing it though! When I was on the stretch stitch, literally every cm or two I would hear a clunking sound and my thread would snap. It wasn’t so bad using the overcasting stitch but it still did broke every 20 cm or so. 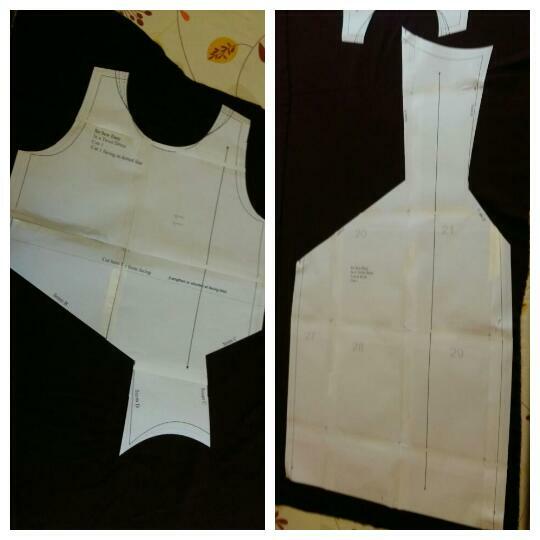 This ought to have been a quick sew but the constant stop-starting made it take ages. I tried adjusting my thread tension, my foot pressure. I re-threaded multiple times, used a ball point needle, used quality thread and it kept on doing it. Does anyone have any ideas? Anyway the dress itself I love! The twist hides my big belly so it is really flattering. Sewing problems aside, the dress was fun to put together and it had some interesting pattern pieces. A little bit of sewing origami but it was perfectly explained on this YouTube tutorial here. 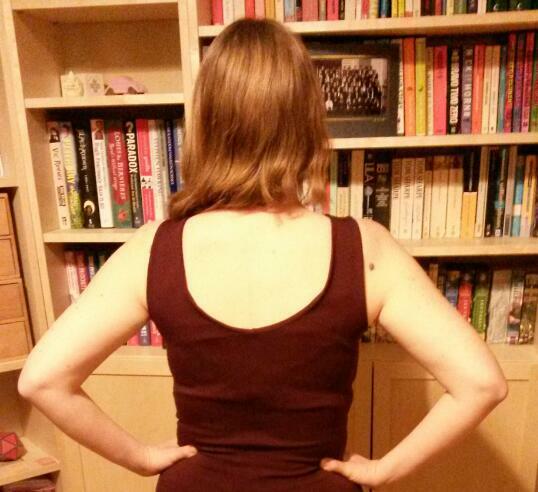 I made a small error at the back where my back seam doesn’t match perfectly at the neck line and some of the facing pops out, but I can live with it. The only ‘thing’ I have with this dress, which I only realised after seeing these photos, is that the fabric shows EVERY lump and bump. I have a lot of these and there’s a reason why you can’t see my bottom half in the above photo! I think I would like to make it again in a patterned fabric as it might disguise all the lumps and bumps! This will make a great dress to take on holiday though. Just pulls on over the head and no ironing required! Your dress looks fab! Much nicer than the drapey dress that you could’ve made! Oh I’ve so got to get myself one of them. I think I would be too self-conscious without one! I think you’re right about the drapey dress too! Perhaps. You never know, I may have another dress whipped up by then! Thank you! It’s so comfy – like a big T shirt really. You would soon get this dress whipped up on your over locker! Love, love, love the style of this dress. Suits you well and the colour is fab! Great success! Btw, what lumps and bumps? !